The complete syntax of Fortran 2003 is supplied. Each of the intrinsic standard procedures is described in detail. There is a complete listing of the new, obsolescent, and deleted features. Numerous examples are given throughout, providing insights into intended uses and interactions of the features. IEEE module procedures are covered thoroughly. Chapters begin with a summary of the main terms and concepts described. Models provide the reader with insight into the language. Fortran continues to be the premier language used in scientific and engineering computing since its introduction in the 1950s. Fortran 2003 is the latest standard version and has many excellent modern features that assist programmers in writing efficient, portable and maintainable programs that are useful for everything from hard science to text processing. 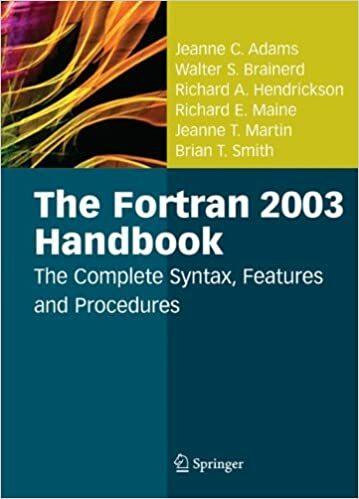 The Fortran 2003 Handbook is the definitive and comprehensive guide to Fortran 2003, the latest standard version of Fortran. This all-inclusive volume offers a reader-friendly, easy-to-follow and informal description of Fortran 2003, and has been developed to provide not only a readable explanation of features, but also some rationale for the inclusion of features and their use. Experienced Fortran 95 programmers will be able to use this volume to assimilate quickly those features in Fortran 2003 that are not in Fortran 95 (Fortran 2003 contains all of the features of Fortran 95). This highly versatile and authoritative handbook is intended for anyone who wants a comprehensive survey of Fortran 2003, including those familiar with programming language concepts but unfamiliar with Fortran. It offers a practical description of Fortran 2003 for professionals developing sophisticated application and commercial software in Fortran, as well as developers of Fortran compilers.